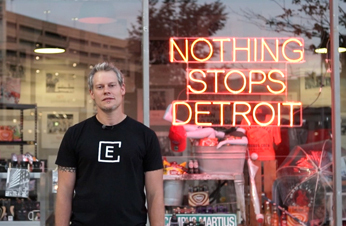 In Detroit you have the opportunity to define the city's future. We appreciate your interest in Miller Canfield and hope that you will take a few moments to become more familiar with our rich tradition, commitment to diversity and ongoing attorney development programs. We are only as good as our people. As a result, we engage in continuous efforts to identify and select the best and brightest legal talent to join our team. The attorneys at Miller Canfield are not only committed to providing superior, cutting-edge service to clients, but they are also entrenched in the respective communities in which our firm has a presence. Becoming a Miller Canfield attorney is more than an opportunity to develop your legal skills and expertise; it is chance to become a member of a dynamic team that values hard work and shares a common goal of achieving excellence in every aspect of our professional lives. Q: How are individuals selected for the program? A: Miller Canfield recruits for the summer program on law school campuses. We conduct on-campus interviews and accept resumes submitted via the Career Services departments from schools not included in our on-campus schedule. Invitations for in-office interviews are extended after the on-campus process is completed. During in-office interviews, the candidates usually meet with five to six attorneys, some individually, and often times in a small group setting (usually lunch). Q: What do you expect Miller Canfield's hiring needs will be for the current year? A: We choose our summer associates carefully and try to hire in anticipation of upcoming needs for entry-level attorneys. Our summer associate classes primarily consist of second-year law students, but we do offer a limited number of spots to first-year law students as well. Our objective is to size the program so that summer associates do not feel that they must compete with one another for offers of permanent employment – an important part of creating the team atmosphere we seek. A: Miller Canfield considers requests for split summers on a case-by-case basis. Generally, we require a summer associate to be with us for a minimum of eight weeks. First-year students who are invited to return as a second-year student receive special consideration and accommodation for splitting the second summer. Q: Will I be expected to work with just one practice group or may I accept assignments from a wide range of practice groups? A: We encourage summer associates to accept assignments from all practice groups, but our program allows flexibility to select assignments, as well. Summer associates also are encouraged to seek out particular assignments from lawyers within the firm as their interests dictate. Our experience is that varying the assignments enables both the summer associate and us to get a more complete picture upon which to comfortably base an employment decision. Q: What training programs are available to summer associates? A: Summer associates are invited to attend a wide variety of training programs. Specifically, they may attend a writing seminar, a practice development seminar, informal gatherings with local judges, and various "field trips" to depositions and hearings and other informational events. Summer associates are encouraged to attend classes offered in-house in substantive areas like business and litigation, as well as non-legal classes on topics like understanding financial reports, using technology, and communication skills. They are encouraged to attend seminars and webinars where Miller Canfield lawyers speak. Summer associates also are invited to attend practice group meetings on a regular basis throughout the summer, and special activities are planned to give summer associates additional exposure with selected practice groups. Summer associates also learn about the administrative, historical and professional organization of the firm. They are introduced to the internal structure of the firm, given the opportunity to meet and talk with the Managing Directors, and receive training on the firm's word processing, e-mail, Westlaw and Lexis systems. Finally, each lawyer who gives an assignment is directed to discuss it with the summer associate, and to provide a thorough written evaluation of the work to the summer associate with a copy to the Recruiting Administrator. Q: What social activities can I expect? A: The summer at Miller Canfield is not all work. In addition to challenging assignments, summer associates have the opportunity to get to know the lawyers in the firm, as well as each other, at frequent social activities. These events have included kick-off and farewell dinners, the Detroit Fireworks, Tigers games, firm receptions, canoe trips, cooking classes and informal gatherings at principals' homes. Q: Which of the firm's offices take part in the summer associate program? A: Although Miller Canfield is an international law firm, the summer program is conducted primarily from the Detroit office, with some participation by the Ann Arbor, Grand Rapids, and Troy offices. Requests to work in our other offices are generally honored based upon the needs of the particular office. A: Yes. Each summer associate is assigned an associate and principal mentor. Mentors are encouraged to answer questions, trouble-shoot, socialize, and, if requested, review written work product. Compensation for summer associates is $2,115 per week. A: Members of the recruiting committee have been active in the summer program and have served as principal mentors to summer associates. Offers generally are for employment beginning after the Bar Exam during the following summer. Special consideration is given to summer associates who will begin federal or state Supreme Court clerkships upon graduation. The firm is generally able to leave offers open for federal or state Supreme Court clerks, for most of the duration of the clerkship. Credit for compensation and principal-consideration purposes may also be given for time spent as a federal or state Supreme Court clerk. Q: To whom should I send inquiries? A: You are welcome to direct resumes or further questions to Michelle Crockett, Director of Professional Development. Inquiries about Canadian summer student and articling student programs can be made to Marco Dolfi.